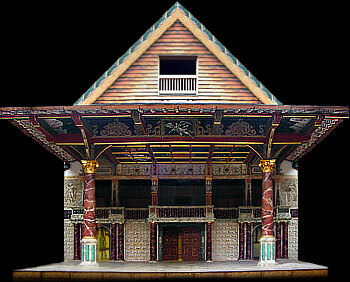 The above picture of the New Globe Theatre stage illustrates some of the different elements of the original Globe Theatre stage. Trap doors were built into the stage allowing dramatic entrances during the performances of plays. The height of the stage was five feet - so the area beneath the stage was easily big enough to hold actors. This area underneath the stage was given the title "Hell". This was taken from the term 'hell mouth' which was used to refer to any trap-door in the bottom of a stage (called the cellerage). The Globe theatre stage was believed to have had two trap doors on the outer stage and one trap door on the inner stage called the "grave trap" Actors would hide in "Hell" waiting to make their entrance or to create other special effects. Unusual special effects could be made from 'Hell' including different sounds using different musical instruments such as the trumpet, or drums. Actors skilled in imitating the baying of hounds and crowing of roosters or the wailing of ghostly sounds would also be waiting in 'Hell'. The stage had a doorway to the left and right and a curtained central doorway from which the actors made their entrances. 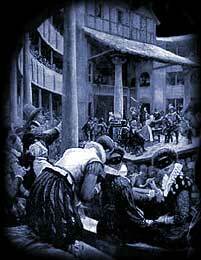 Interesting Facts and information about the Globe Theatre Stage. Additional details, facts and information about the Globe Theatre can be accessed via the Globe Theatre Sitemap.